Photos, clockwise from top: Barbara Rosner’s digitally captured inkjet print “Morning Fence and Bench” won second place in the Pagosa Springs Arts Council juried photography show. “Ribbons of Dew” by Linda Pampinella won first place and “Rubrum Lily” by Al Olson third place. “Traces” by Al Olson. The annual photography show at Pagosa Springs Arts Council was juried this year by Amy Wendland, chairwoman of the Fort Lewis College art department. She said at the opening last week that she had selected the work from digital images she viewed on her computer. It’s always a challenge to do so, and Wendland’s reaction to seeing the images matted and hung was typical of every juror I have interviewed. A certain red seemed brighter, the image appeared different on the screen or the image was cropped differently in digital version. Yet, all in all, Wendland felt the 25 pictures she selected were the strongest of the 41 images submitted. The pictures were shown with colorful baskets by Pat Jeffers, which were vibrant and textural. Awards were given to the top three photographs. 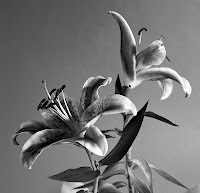 Third place went to Al Olson for “Rubrum Lily,” a silver gelatin print ($245). Second place was awarded to Barbara Rosner for “Morning Fence and Bench,” a digitally captured inkjet print ($175). First place was bestowed on Linda Pampinella for “Ribbons of Dew,” a digitally captured inkjet print ($200). Pampinella’s image may seem familiar to some; it was recently published in Arts Perspective magazine’s photography issue and won second prize at the magazine’s “Published Works” exhibit at Open Shutter Gallery. The image is of a rusted canoe and features horizontal layers of greens and golds with a ribbon of shiny varnish running through the middle; at one point, the ribbons are vivid red. Olson captures the veins on the leaves of his lily and the speckled dots on the petals of the flower. The heavily flocked stamens are velvety black. But I would have given the prize to Olson’s other entry “Traces,” a landscape featuring a geyser spewing water into the air from a silky black lake. The ground is covered in snow, but the trees are not flocked. Snow-capped peaks highlight the middle ground. The image is all about the sky. The geyser is shooting up into the sky filled with sheer clouds and jet trails. 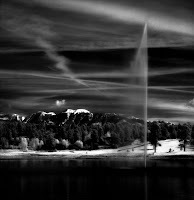 Jet trails cross in an X, and the geyser juts up into that X like a line crossing it at its midpoint – a mathematical symbol. More linear clouds mark up the sky and then spiral off into the upper left edge of the image. Rosner has three images in the show and was surprised when she received her award for “Morning Fences and Bench.” Rosner and others thought “Adobe Textures,” an abstracted image of adobe walls would get her the honors. And while the color and design of “Adobe Textures” is powerful, the image almost seems overworked. In “Morning Fences and Bench,” the intense colors seem real, and there is a depth of field in the layers of fence and bench and shadow that provide a lot of interest. I admire the way the contrasting design in the fence and the bench keeps the eye moving and how the shadow and light allow the eye to rest. As a requirement, all of the work had to be matted in white and framed in black. The presentation is elegant, and each work benefits from the classic display technique. The images are allowed to speak for themselves. And speak they do. September 15, 2007 in ART.